Whether or not you know Chef Josh Agan’s name, there’s a good chance you’ve eaten his food. Agan has been at b.b.’s, Flying Iguana, and Coop 303, and now he has launched his own private cheffing company, Routes: Culinary Travels. Chef Josh Agan has joined Chef Rosaria and seven other local chefs to put together one incredible night of local, sustainable food, with proceeds benefiting Waste Not Want Not. The Earth Day Farm Fresh Feast is April 22 at Atlantic Beach Urban Farms. We met up with Chef Josh at ABUF where he created a gorgeous octopus terrine. You can watch part of the magic here, or try your hand at it at home! If you’d just rather Chef Josh make it for you, contact him here. 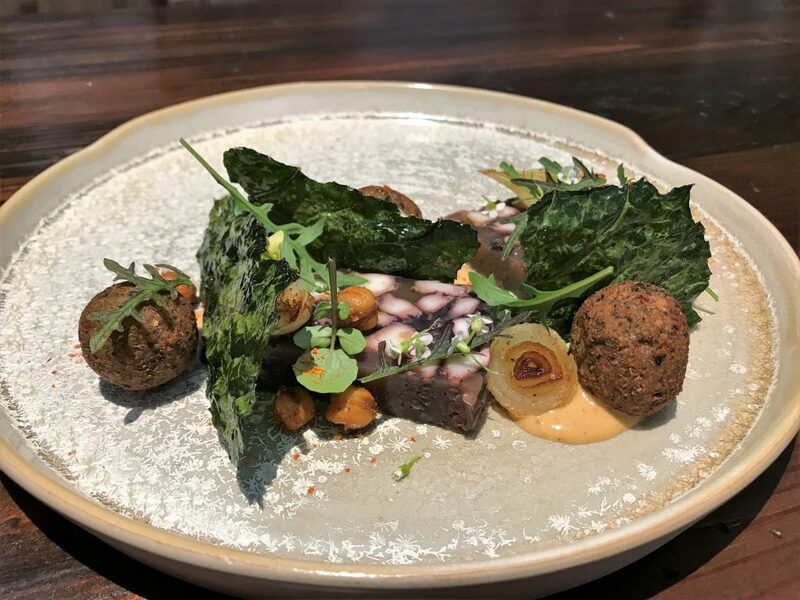 Chef Josh Agan formerly of bb's, Flying Iguana, and Coop 303 throws down with an octopus terrine! Wash octopus thoroughly and dry. Wrap herbs and lemon zest together to create a sachet. Place in a vacuum bag with remaining ingredients and seal with cryovac machine. Cook sous vide for 6 hours. Remove the octopus from the bag and reserve the juices. Combine 1/2t of powdered gelatin with 1 cup of octopus juice and pour into a plastic wrapped terrine mold (or small breadloaf pan) Trim tentacles to fit the pan and arrange them packing as tightly as possible. Fold plastic wrap over top of terrine, place another pan on top with weights and refrigerate until set, at least 6 hours. Soak garbanzo beans in water for 24 hours. Drain thoroughly and chop in a food processor. Add remaining ingredients and process to a fine paste. Form into 1 oz balls and fry at 350F for 3 minutes, or until golden brown and crispy. Puree in a blender until smooth. Thin with water to create a saucelike consistency. Remove any stiff ribs from kale. Brush with oil and sprinkle with spices. Bake on a parchment lined sheet tray for 10 minutes at 350F. Tagged charity, Chef, events, local, Private Dining, recipe. Bookmark the permalink.